The photo above of a second generation Adonis Blue Polyommatus bellargus taken at Martin Down in Hampshire shows the typical chequered fringe of the male. This is a butterfly which can only be confused with the male Common Blue Polyommatus icarus but in comparison that has a plain fringe as can be seen here. In my opinion the Adonis Blue is bluer, less purpley and the colour is rather more dense. I’ve found that the wings of the common blue are slightly translucent, so depending on the light, the spots and markings on the underwings can often just show through. You may just about be able to make this out depending on the quality of your monitor. Adonis in Greek mythology, is the male god of beauty. 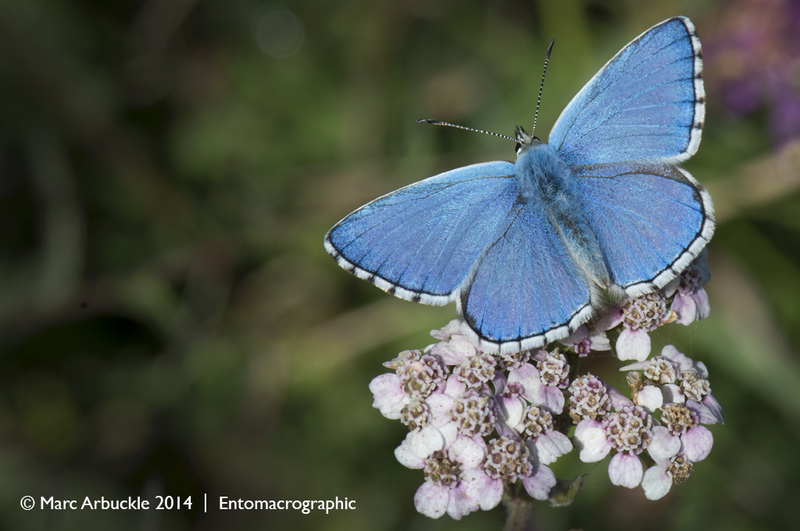 This is certainly a handsome butterfly, arguably the most attractive of the British blues. What do you think? Feel free to add your comments below. Glad to hear from you again Wil. There appear to be plenty around at the moment so I hope you manage to get another tick. It seems like the Lycaenidae don’t really like to spread their wings for me too often, but they are one of my favorite groups of Leps regardless. That’s probably a product of the minimal working distance a reversed 18-55mm gives, and also probably accounts for why I have the impression that blues in Europe and the UK seem a bit deeper and truer than the ones in New England. Whatever it is, that’s a lovely shot; I never get tired of those Polyommatus species. Hello Michael, Yes I guess you do need to get pretty close with your reversed lens. Less so with my 105mm. However, you do seem to get some fabulous results which I suspect has more to do with your technique than the method. You’re very good and I look forward to seeing your posts. We have 3 Polyommatus in Britain, the third being the much paler Chalk-hill Blue Polyommatus coridon. There are more in Europe. Thanks for the kind words, Marc. Looking forward to getting some posts up soon after being away including some on my gear and process. I took a quick peek on Bugguide.net and apparently one Polyommatus, P. icarus, has made the transatlantic voyage, though the only records appear to be in Canada. They are such beautiful little wonders. I’ll look forward to reading those as I’m really interested on how you get such excellent results. As for Polyommatus icarus, which we rather unfortunately call the Common Blue, sadly it no longer is, but then, nothing is. Maybe we should use its alternative name of Icarus Blue.